A year ago today the Chicago Sun-Times laid off their entire photography department, replacing veteran photographers with freelancers and reporters armed with iPhones. 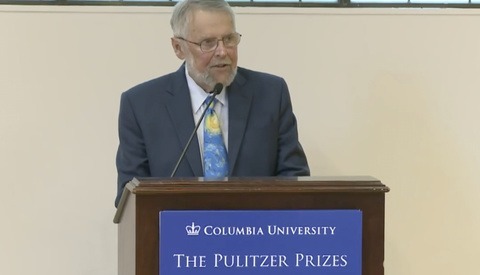 This move left 28 people without jobs, including pulitzer prize winning photographer John H. White. 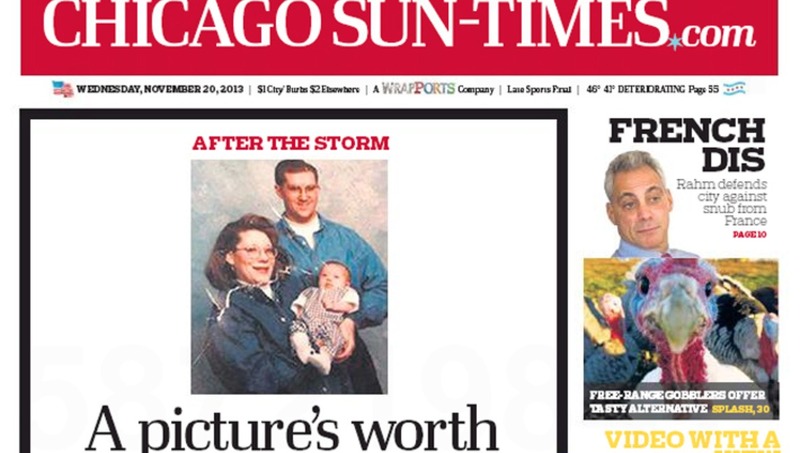 From the Tumblr SunTimes/DarkTimes, Chicago Tribune's coverage of Gay Marriage being legalized on the left and the Sun-Times Coverage on the right. 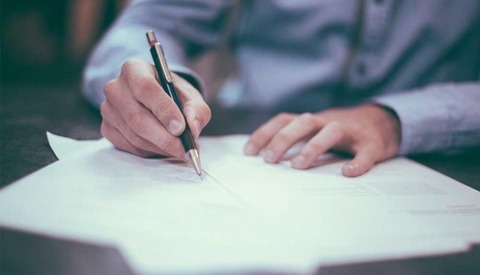 The Sun-Times explained the decision in a statement to Chicago Business as an attempt to keep up with the times and provide more video and multimedia, “The Sun-Times business is changing rapidly and our audiences are consistently seeking more video content with their news. We have made great progress in meeting this demand and are focused on bolstering our reporting capabilities with video and other multimedia elements. The Chicago Sun-Times continues to evolve with our digitally savvy customers, and as a result, we have had to restructure the way we manage multimedia, including photography, across the network." 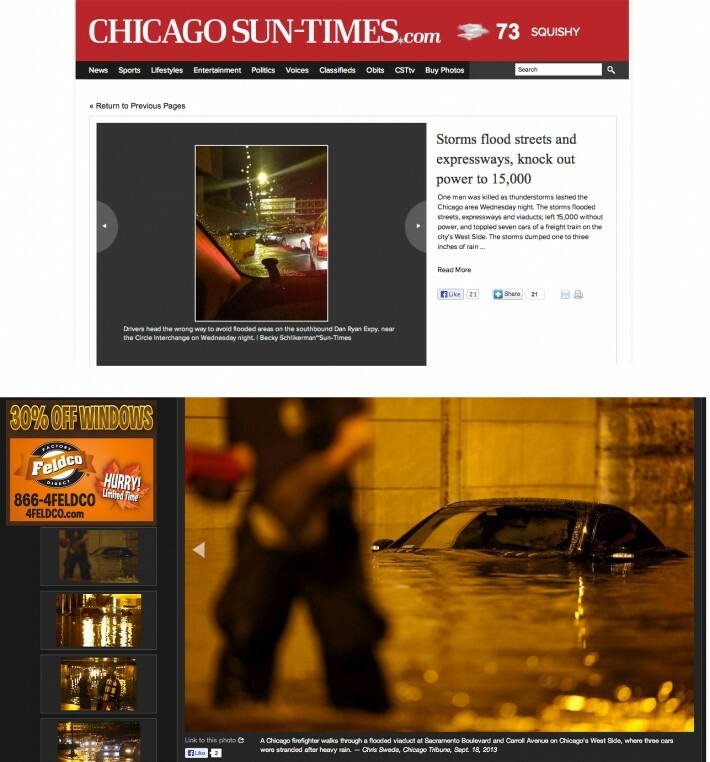 From the Tumblr SunTimes/DarkTimes the Sun-Times Coverage of a flood above, taken by a reporter with a camera phone in their car, and the Chicago Tribunes coverage of the same flood below. A day after the layoffs were announced, media writer Robert Feder shared a memo from the Sun-Times Managing Editor Craig Newman, telling reporters they would begin mandatory training of iPhone basics. “In the coming days and weeks, we'll be working with all editorial employees to train and outfit you as much as possible to produce the content we need,” Managing Editor Craig Newman said in a memo to Sun Times staff. 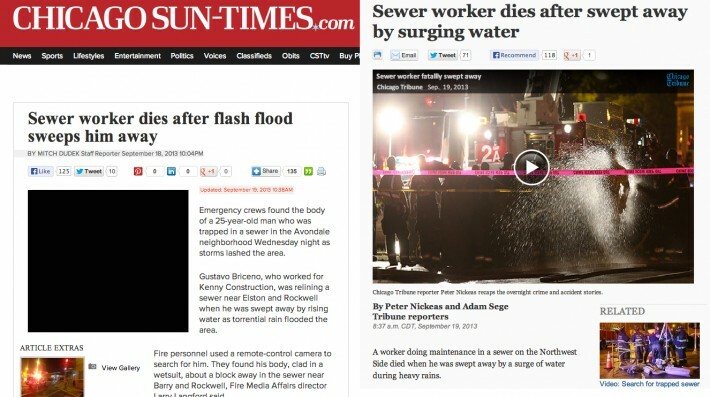 In the aftermath Chicago freelance photographer Taylor Glascock created the tumblr Suntimes/Darktimes to show the disparity of the work between the Sun-Times and it's competitor the Chicago Tribune. She began posting the front pages of each newspaper to show how the two newspapers were covering the same stories. It's been a year, a long year for the photojournalists who suddenly found themselves without work, and a lot has happened since then. In December, the Sun Times made an agreement with the Chicago Newspaper Guild to hire back four photographers that it had previously fired. Those photographers include Rich Chapman, Brian Jackson, Al Podgorski and a fourth whose name cannot be confirmed. These four are the only photographers of the 28 that have gone back to working full time at a newspaper. 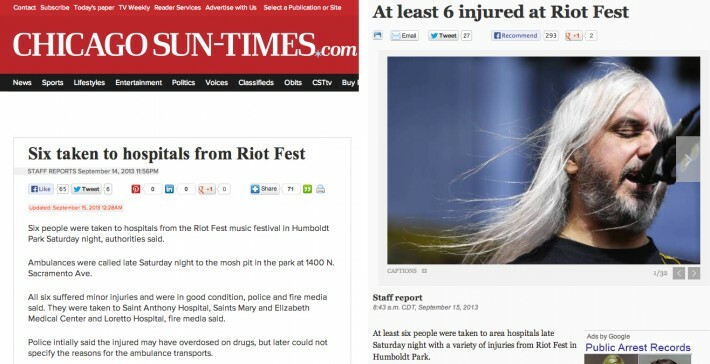 The Sun-Times, on the left, has no photo to accompany a story about concert goers being taken to the hospital after Riot Fest. From Suntimes/Darktimes. Three, including John H. White, have taken jobs in the photo departments of nearby universities. Another four have found jobs at Yahoo and at least three have changed jobs completely, giving up the camera for a different profession entirely. Most of the others have found work as freelance photographers. For more information on what happened to the Sun Times 28 go this Poynter article that talks to several of them about life after the Sun Times, http://www.poynter.org/latest-news/mediawire/254014/one-year-after-28-sun-times-photojournalists-were-laid-off-where-are-they-now/. I'm in Orlando and the Sentinel did the same thing. They got rid of their photojournalists then hired back a few "mobile" specialists. Once accomplished photographers had to reapply to do their own jobs with iPads. How humiliating. Sadly, this may be a trend for a few years until the publications get their head out of their rear ends and realize that there are going to be some serious issues with using photo submissions from the general public. There is no fact checking on the photos and they are sometimes misrepresentations, which make the publication look like a bunch of idiots. That would never fly with written stories, so I'm not sure why there is such little valuation on photographs. Honestly, I can hardly blame the papers though. There are fewer people reading printed editions and more people reading online. And readers want their stories and photos yesterday. They will gravitate towards sites that have stories breaking first and the first photos up. It's a business decision they made to save money and I really do think in the long run it is a mistake and will be reflected in their bottom line. You can't sacrifice quality and expect to increase profit margins. This is an age old disagreement in the business world though and we'll just have to see how it plays out. I say it was a smart business decision. Look at all the examples given. In many of the cases, the image adds nothing to the story, and at that point, you've paid the photographer for pretty much nothing. It's very rare to come across a newspaper story where the one image provided (in most cases) makes or breaks the article. More than almost any other career (I almost said profession), what is it about photographers that gives many of them this overinflated sense of self worth? I am so glad I got out of the business when I did and do it only as a hobby now. Photographers are always complaining about how jobs are being reduced and there's no opportunities anymore. Fact: there is simply little need for us, plain and simple. If there were more, then obviously there's be more job opportunities and less lay offs. I think we tend to forget that even though we are capable of producing extraordinary images, most people simply don't care as much. The vast vast majority of people do not care about things like composition, lighting, sharpness, bokeh, etc. What I've found in over the last couple of years is that all most people really care about is if you captured the right moment. With regards to that, there's very few disciplines of photography where the right moment is so fleeting that it is difficult to capture: weddings and sports. Naturally, those are also the areas where it is still possible to make a living off of. Jobs are being reduced in every field. I'm in accounting and finding a job is ridiculous. People don't want to pay accountants or want ridiculous qualifications that don't exist. Everyone is cutting back from full time to part time but requiring unworkable hours if you need a second job to make ends meet. Accounting is now more or less data entry. Any business knows that in order to succeed it has to have hire experts. Anyone can build a website these days, but if you want to be #1 you want someone who does nothing but build websites instead of someone who can play with WordPress. If you are a publication, you need to hire people who do nothing but tell stories whether it is written or visual. Somehow writers have escaped the layoffs even though anyone is capable of stringing together a couple of paragraphs. The vast majority of papers are still paying photographers which leads me to believe that they have changed their business model to maintain profits without devaluing the photographers. I agree that lots of fields (but not all, trust me, my "new" field after photography has seen growth for over a decade straight) are reducing jobs. Of course there will always be a need for experts in every field. But let's not lose sight of what's happening to the non-experts. 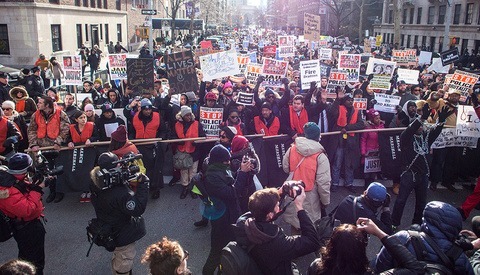 Regarding newspapers, yes, the majority are still paying photogs. However, that is a vague statement and doesn't begin to describe the truth. In the last five years, the average photographer salary for newspaper staff has decreased. Benefits have decreased (although this is generally true for all newspaper employees). Compensation for equipment and travel expenses has decreased. I saw this first hand (and I'm much happier doing it for fun than for pay now). So to say that newspapers have not devalued photographers simply because many still have them on their staff is flat out wrong and completely ignores the reality of what is happening. I'm in Orlando. It isn't that there are no jobs or that every job out there pays too little, a lot of companies want things that simply don't exist. I called about a resume I sent in and was told that they were looking for someone with a degree in retail management accounting and there is no such thing. I get turned down a lot for very specific pieces of software I don't work with because they are almost proprietary. Temping is good if you don't have a job, but since I have income I'm not going to cut it off to take something that will be 2-3 months. I'm more or less job hunting for income stability instead of the consulting roller coaster. Disagree. Entirely. Except for the part about being glad you're out of the business. That I agree with, since I don't think anyone should work in a field they don't value. I'd love to hear your points, rather than simply stating stuff. Do you have any interest in a discussion? I'm free to state my opinion, as are you. My point is that I disagree. I don't think I'll convince you to change yours. No, I don't have any interest in a discussion. Thanks for the offer though. People lose their jobs but it does give more opportunities to up and coming photojournalists to get some credibility with a newspaper. No it doesn't ... it's not just a question of people losing their jobs ... those jobs are GONE! It's not like they fired 20 people to hire another 20 new photographres they CUT 28 jobs from the job market. And the freelancers? The rates they are being offered are RIDICULOUS! These are effective for any assignments 6/24 and going forward. I'd give you a source on this but then my post would need to be moderated so just Google "Chicago sun Times Freelancer Rates" and you'll find an memo from the CST from 2013. 65$ for an assignment? How much of that is left after hard costs (travel, parking, 3G data used to instantly send the photos to the editor ...) and business costs? The paper I referred to above has NO photojournalists. They hired 2 people as mobile video editors and issued them iPads to tool around the city with. When they realized that this isn't Harry Potter and we still need still photos for paper newspapers they have had to figure other things out, such as working with freelancers. But the rates are pitiful, it might buy you dinner OR a movie, and in no way a means to support your family. Our liberal newspaper in Montréal "LaPresse" has gone digital also and are planning to ditch the paper edition alltogether. May the Chicago Sun Times experience a long, slow, expensive demise. One of the problems is that online versions of print options often offer just thumbnail images on their pages. Sure the reader can click on the image to study it, but in an impatient world I'm guessing few do that. If newspaper companies and magazines truly understood the power of dramatic and beautiful images, then they'd have large pictures drawing the reader in and of course this would require professionals to take them. Nowadays, "good enough" is good enough. If you're providing better than that, well then you're probably just too expensive. Your last statement is completely true. Good enough usually is good enough. I used to be guilty of this, and most photographers these days still are guilty of this. We overestimate the value of our work. Our work is fantastic, and people will be hard pressed to find better, but often times the level of our quality is simply not needed and goes unnoticed. Most people don't have the eye for lighting and composition that we do. We may make an awesome picture, and people will say "awesome!". Someone else may take a picture that we photogs view as okay or amateurish, but regular people will say "awesome!" One of my good friends who just got married had his uncle shoot the wedding. I cringed when I saw the pop up flash and all the odd angles he was shooting at. After my bud posted the pics online, they truly were as bad as I pictured they would be. But you know what? The bride and groom loved them, as did all the comments of "love this!" and "this is amazing" and etc from other friends. So when your amateur uncle can produce photos that are good enough for free, why on earth would you pay several thousand when you can't even tell the difference.